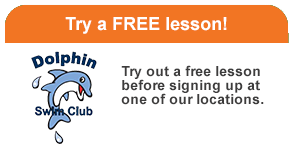 Why Dolphin Swim Club – DSC? We’re committed to our reputation as a swim school of the highest quality. We offer a modern alternative to traditional large group, summer swim lessons to make your child learn faster and have more fun. We have indoor classes year-round, and you can start any week of the year. To provide easy scheduling,* call us the week before you would like to start lessons to find the best level, class, and weekly time for your child; classes are once-weekly for 30 minutes. Once you start, we require that you commit to at least two full months of lessons because we want you to see a substantial improvement in your child’s skills and, more importantly, we want your child to retain the skills they learn. Payments are made easy from the start with monthly automatic payments taken from a credit card kept safely on file. After that initial enrollment, you never have to re-register; we will hold your child’s spot until you ask for a schedule change, your child graduates into the next level, or you need to take a break. One of the best things about our open enrollment scheduling is that your child can move up throughout our nine levels as soon as he/she is ready; we will never restrict your child’s learning because of age or time spent in a class. We love our advanced classes with four and five year-olds swimming the butterfly stroke! Then, if you need to take a break from lessons for any reason, you can stop your enrollment anytime with a 30-day written notice (needed to stop your payments and make sure your account is settled). 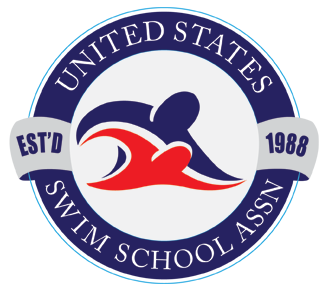 *Since we are a specialty school that provides only swim lessons, all of our efforts are focused on making classes and experiences great. To make scheduling and your account access even easier, check out our online Parent Portal! We Want To Make Your Children Safer! 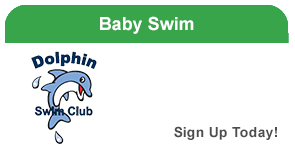 Dolphin Swim Club is committed to bringing water safety to your family by providing a safer environment for your children to enjoy the water and through teaching your family how to be safer around any body of water. All of our teachers are lifeguards and certified in First Aid and CPR. We also support the Safer 3, a national non-profit organization dedicated to preventing childhood drowning. The Safer 3 provides levels of security that will help to prevent these unfortunate accidents. Safer 3 provides a multi-layered approach to drowning prevention. Safer Water … Safer Kids … Safer Response are the three elements of the Safer 3 program. Refers to the protection against an unauthorized entry to a pool or spa by a child that has little or no swimming skills. There are many types of protection available including barrier fencing with latching gates, alarms, door locks and pool covers. Involves both caretaker and the potential victim, the child. Constant adult supervision by one with swimming ability, swim skill attainment through ongoing lesson programs by qualified instructors and education of parents and children as to proper behavior in and around the water are key components. Is the preparation for the event of a drowning accident. Rescue techniques such as CPR and rescue breathing should be learned and reviewed. Developing an action plan and having rescue equipment on hand are also important. Being a good swim parent is the key to your child’s swimming success. There are a few things you can do to be a good swim parent and help make your child’s learn-to-swim experience be as fun and productive as possible. Your attitude determines your child’s attitude. Be positive about swimming, the program, the swim teacher, and the child’s participation in class. Teach your child to dream big — and never teach him to settle for anything. Do everything you can to open doors of opportunities for him to realize even his biggest dreams. Re-define your idea of “success.” While only one person can win the race, each participant can achieve personal success. Success is determined when an individual sets and meets personal goals. Help your child do this at first, and then let him set his own goals. Don’t reward success with bribery because it is only a short-term solution. Helping your child to internalize his or her successes will lead to the success itself being the reward for a new achievement. One estimate says it takes 100 to 150 hours of consistent, year-round instruction for a child to learn how to swim — which amounts to about two years of continuous education. Consider the time it takes to learn to read. Children must practice a little each day with an increase in the difficulty levels at certain intervals to learn to read well. The same applies to learning to swim. No child is going to learn to swim in one or two sessions. Although large milestones may not be made in every class, small steps are still being accomplished. It is important to be consistent and not to allow your child to give up. Thank you for reading this article. Most of these suggestions are things that you already do but it is good to know that other parents are experiencing the same things that you are. Always know that we are behind you 100%. Let us know if there is anything that we can do to help. 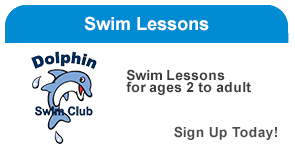 The mission of Dolphin Swim Club is to bring confidence, self-esteem, and safety to every child. We accomplish this by breaking complex skills down into a series of easier skills. We teach the lifetime skill of swimming, thus giving a gift that lasts a lifetime. Dolphin Swim Club made its debut in 1991 in Rockford, Illinois, and built its first facility in nearby Loves Park in 1997. Nine years later, Dolphin expanded into the Chicagoland Area with a school in Crystal Lake. Our Crystal Lake school is housed in a 8,880-square-foot facility at 825 Munshaw Lane.